Build Bridges to Employment: Find the job that works for you! 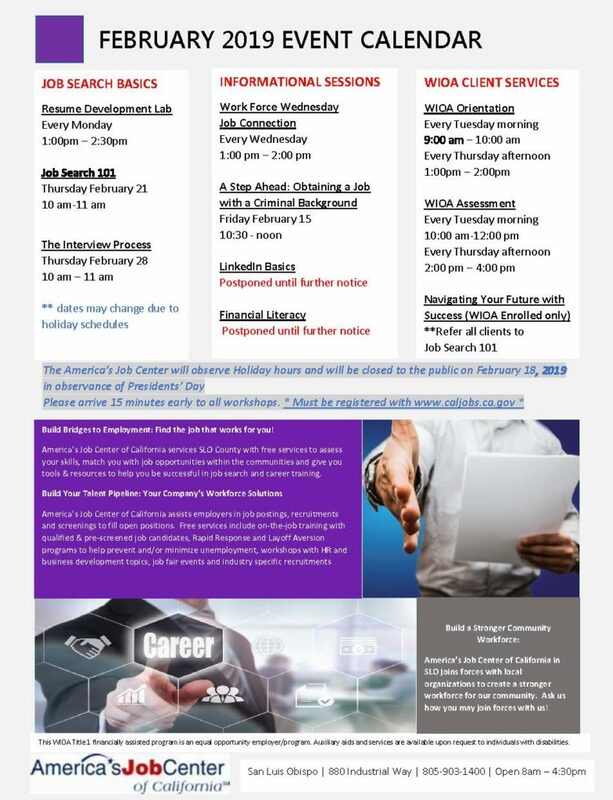 America’s Job Center of California services SLO County with free services to assess your skills, match you with job opportunities within the communities and give you tools & resources to help you be successful in job search and career training. Build Your Talent Pipeline: Your Company’s Workforce Solutions America’s Job Center of California assists employers in job postings, recruitment’s and screenings to fill open positions. Free services include on-the-job training with qualified & pre-screened job candidates, Rapid Response and Layoff Aversion programs to help prevent and/or minimize unemployment, workshops with HR and business development topics, job fair events and industry specific recruitment’s.